Posted by elizabethwong in Art & Visuals, Note2Self, RIP. It began and ended at Valhalla (Glebe). Don’t get too upset with Zam. He has difficulties with enunciation (poor babe). He wasn’t lucky to have those elocution classes like some of you. He could be well be saying, “Go-Blogs!” or “Grrrr-blogkkk“. Either way, he’s just a foot-soldier. Think chess. You have to give the pawns the side-kick, move your key pieces to control the centre and aim for Mr Pointy-head and his inner circle. Otherwise, Pointy-head will just ‘castle, making it harder to checkmate in five moves. Go play chess and chill…. Sebenarnya, saya ngada masalah dengan Si Monyet. Saya duduk dekat sebuah bukit bersama banyak ekor monyet. Mereka tidak suka cari apa pasal dengan penduduk yang lain. Saya biasanya memberi sedikit buah-buahan kalau terjumpa mereka. Tetapi apabila tempat tinggal and sumber makanan mereka (iaitu si Monyet) diancam oleh pembangunan yang langsung tidak peduli kepada alam sekitar, seperti pembinaan kondo dan bungalow mewah (dan biasanya melalui saluran yang tidak jujur) yang tidak membawa apa-apa faedah kepada penduduk di persekitaraan bukit, si Monyet akan berkeliaran. 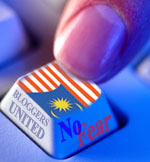 Sunday July 29, 2007, The StarKUANTAN: Bloggers are as liable for defamation as publishers of printed materials, Datuk Seri Abdullah Ahmad Badawi warned. “It is wrong for bloggers to go overboard, especially if they post slanderous articles against the Yang di-Pertuan Agong and Islam on the website,” he told reporters here yesterday. It is wrong of you to be jetting off on yet another holiday without a public announcement. I may not like the former Prime Minister much, but at least he rarely took holidays and announced them in advance. It is wrong of you to not even fly back and mourn the tragic loss of those who serve the country due to faulty helicopters. Saya dimaklumkan bahawa Raja Petra sedang berada di Balai Polis Dang Wangi sejak pagi ini, mengenai laporan polis yang difail oleh bekas Menteri Besar Selangor Mat Taib. Tindakan polis yang begitu lancar dan cekap membuktikan sikap dan respon yang berat-sebelah kepada pemimpin Umno. Adakah pihak polis bertindak sebegini apabila pihak lain membuat laporan polis, seperti tentang kes rasuah pemimpin? Ah … soalan retorik sekali lagi. Sebenarnya, laporan polis terhadap Petra langsung tidak masuk akal. Beliau merupakan seorang dari golongan kerabat yang setia. Dia seorang Muslim yang kuat imamnya, sampai mengeliru segelintir daripada kami, dimana beliau kadang-kala digelar ‘born-again Muslim’. Apa yang istimewa dalam catatan Petra, selain daripada tulisannya yang bercorak ‘thriller’ politik dan amat berwarna-warni, ialah pendedahan kes-kes rasuah dan penyalahgunaan kuasa, seringkali dilampir dengan bahan bukti yang kukuh. Tetapi adakah pihak berkuasa bertindak atas pendedahan tersebut? Mengapa kita membiarkan keadaan ini berterusan? Petra tidak bersalah (bebas Petra!). Orang yang sepatutnya diheret ke balai polis dan ke mahkamah bebas (tangkap mereka!). Adakah ini adil, ataupun ini keadilan a la Malaysia? Posted by elizabethwong in Art & Visuals, Note2Self, Readings. Alan Riding: What has happened to culture’s challenge? (IHT, 20 July) PARIS: For the past three years, this column has sought to make the case that art and life or, more broadly, culture and society are natural interlocutors: just as art can express life’s emotions in a coherent form, culture can provide society with a spiritual dimension and an ethical framework. Now, in this valedictory Entr’acte, the moment has come to test this premise. Can the arts actually improve the way peoples and nations understand and behave toward each other? Or does culture, in both its popular and sophisticated forms, represent little more than introspection, escapism and divertimento? As for responsibility, can countries expect artists, writers and intellectuals to serve as a moral compass in times of public confusion? Or are modern democracies happy for social and political questions to be the exclusive preserve of elected officials? Posted by elizabethwong in International, Malaysia, Readings, Southeast Asia. NEW YORK — A Pakistani national was arrested Thursday on allegations he illegally shipped weapons to Malaysia, including fighter jet parts likely to end up in Iran. Jilani Humayun, 59, was charged with 11 counts of violating the Arms Export Control Act, one count of conspiracy to commit mail fraud and one count of conspiracy to commit money laundering. The charges carry up to 150 years in prison upon conviction. I was arrested on Friday, the 13th of July at approximately 4.30pm in the carpark basement (B3) of Phileo Damansara I by about four to five policemen. While originally being taken in for questioning, the police arrested me when I conveyed to them my lawyers advice that I should not accompany the police to their office unaccompanied by legal counsel. From Phileo Damansara, I was taken to my house where the police confiscated my computer, some CD’s and some documents. From the moment I was arrested until about 11 pm, I was not allowed to speak to anyone I knew, or inform anybody of my whereabouts. Duh… Surely you’re not that desperate to be PM? Ignore the title. I’d blogged from Bukit Perdana earlier on my hp. Media:- I want to convey special thanks to the Chinese media who ran Nat’s arrest and detention as a major story, some even giving the issue front-page treatment; bloggers who kept up the pressure by writing about it and signing the online petition; and the alternative e-media outlets i.e. Malaysiakini, MerdekaReview, Harakahdaily and KLPos. The issue was hot for 5 full days. thanks to them. We had waited til 5 pm. Everyone was going nuts. Boredom brings out the creativity in us. I threatened to climb the tree next to the guardhouse and hang banners. The Chan brothers had dastardly ideas for the flag poles. But all’s well! The revision of Nat’s original remand will still go on tomorrow (Wednesday) at 9 am, Criminal High Court 3. The lawyers are Sivarasa Rasiah and Amer Arshad Hamzah. The Bar Council will be holding a watching brief, as there are serious abuses in the arrest of Nat. Please send good vibes to these two fabulous lawyers who are doing it pro bono. Not sure how it will turn out – sigh… the judiciary …. *Someone* tried to talk the family from continuing the revision, (ya … we know who you are). Scared la. Tough luck. You are so going down for trying to trick, intimidate and detain Nat.